Last weekend at Music Hack Day Boston, I teamed up with Jennie, my 15-year-old daughter, to build her idea for a music hack which we’ve called Jennie’s Ultimate Road Trip. 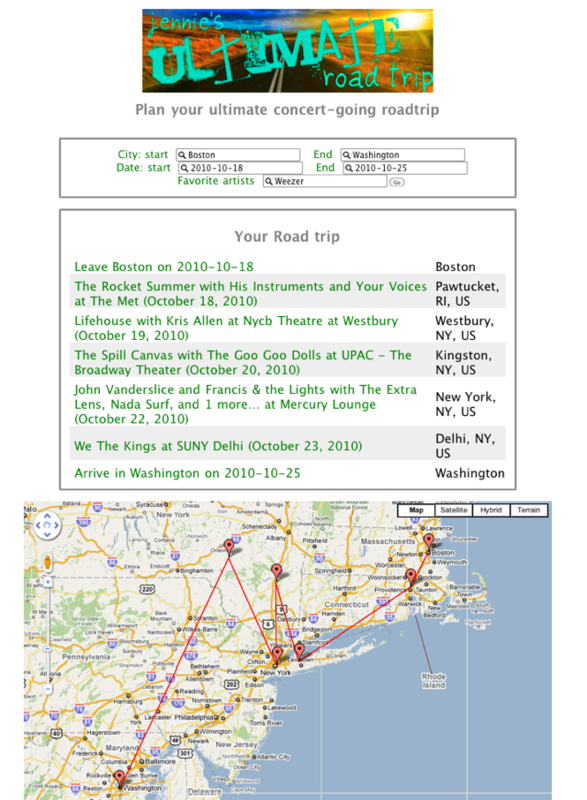 The hack helps you plan a road trip so that you’ll maximize the number of great concerts you can attend along the way. You give the app your starting and ending city, your starting and ending dates, and the names of some of your favorite artists and Jennie’s Ultimate Road Trip will search through the many events to find the ones that fit your route schedule that you’d like to see and gives you an itinerary and map. We used the wonderful SongKick API to grab events for all the nearby cities. I was quite surprised at the how many events SongKick would find. For just a single week, in the geographic area between Boston and New York City, SongKick found 1,161 events with 2,168 different artists. More events and more artists makes it easier to find a route that will give a satisfying set of concerts – but it can also make finding a route a bit more computationally challenging too (more on that later). Once we had the set of possible artists that we could visit, we needed to narrow down the list of artists to the ones would be of most interest to the user. To do this we used the new Personal Catalogs feature of the Echo Nest API. We created a personal catalog containing all of the potential artists (so for our trip to NYC from Boston, we’d create a catalog of 2,168 artists). We then used the Echo Nest artist similarity APIs to get recommendations for artists within this catalog. This yielded us a set of 200 artists that best match the user’s taste that would be playing in the area. The next bit was the tricky bit – first, we subsetted the events to just include events for the recommended set of artists. Then we had to build the optimal route through the events, considering the date and time of the event, the preference the user has for the artist, whether or not we’ve already been to an event for this artist on the trip, how far out of our way the venue is from our ultimate destination and how far the event is from our previous destination. For anyone who saw me looking grouchy on Sunday morning during the hack day it was because it was hard trying to figure out a good cost function that would weigh all of these factors: artist preference, travel time and distance between shows, event history. The computer science folks who read this blog will recognize that this route finding is similar to the ‘travelling salesman problem‘ – but with a twist, instead of finding a route between cities, which don’t tend to move around too much, we have to find a path through a set of artist concerts where every night, the artists are in different places. I call this the ‘travelling rock star’ problem. Ultimately I was pretty happy with how the routing algorithm, it can find a decent route through a thousand events in less than 30 seconds. Jennie joined me for a few hours at the Music Hack Day – she coded up the HTML for the webform and made the top banner – (it was pretty weird to look over on her computer and see her typing in raw HTML tags with attached CSS attributes – kids these days). We got the demo done in time – and with the power of caching it will generate routes and plot them on a map using the Google API. Unfortunately, if your route doesn’t happen to be in the cache, it can take quite a bit of time to get a route out of the app – gathering events from SongKick, getting the recommendations from the Echo Nest, and finding the optimal route all add up to an app that can take 5 minutes before you get your answer. When I get a bit of time, I’ll take another pass to speed things up. When it is fast enough, I’ll put it online. It was a fun demo to write. I especially enjoyed working on it with my daughter. 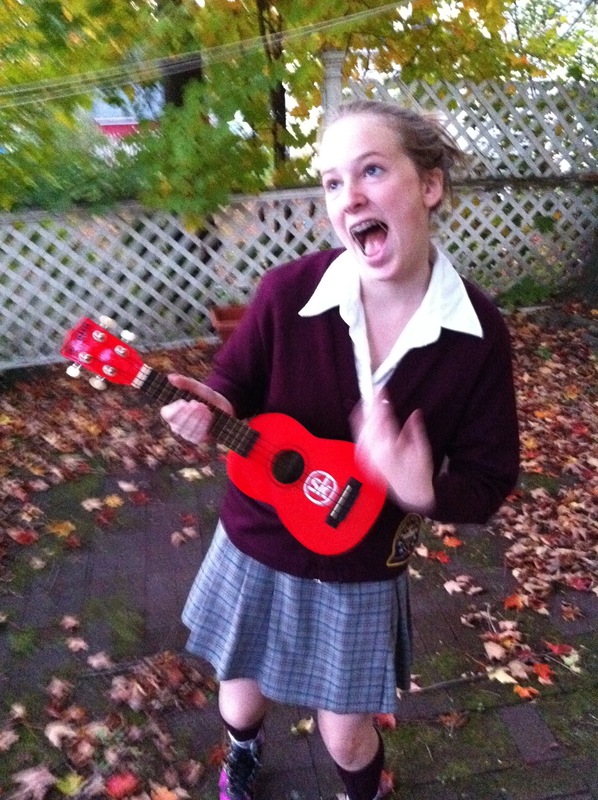 And we won the SongKick prize, which was pretty fantastic.